Mucuna pruriens, recognized as an aphrodisiac in Ayurveda, has been shown to increase testosterone levels, helps deposition of protein in the muscles and increase muscle mass and strength. The extract is also known to enhance mental alertness and improve coordination. It is used as a nervine tonic for nervous system disorders because of the high concentration of L-dopa in the seeds. It has been studied for its possible use in Parkinson's disease. It was found to slow the progression of Parkinson's symptoms (such as tremors, rigidity, slurring, drooling and imbalance). 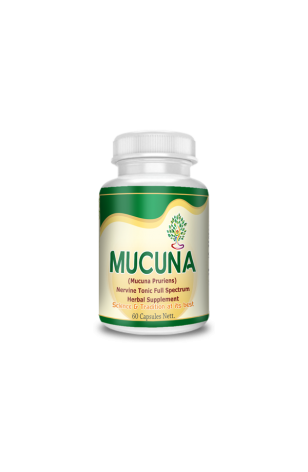 Mucuna has none of the side-effects of the current pharmaceutical L-dopa.